6 Climbing log entries Found. Newcomers to the Adirondacks! Four of them, and Jay was the perfect intro. Wanting to give newcomers Trevor, Rae, Claire and Tanya a scenic but relatively easy ADK intro, I chose Jay Mountain: not too busy, super scenic, non-torn up trail, lots of terrain variety - I could go on for a while. We had a pretty decent weather day, sun and clouds - but a bit hazy and rather windy. The rainy spring/summer of 2017 meant that even parts of the normally dry Jay Mountain trail were muddy, which was quite a surprise. We turned around at one of the more prominent of the eastern sub-summits, since the true summit is a a bit tedious to get to and doesn't offer any better views. A "Twilight Hike" - an Alpine Club sponsored trip up Jay Mountain, with the express intent to arrive on the summit ridgeline during and after sunset, with the intent to experience all the scenic beauty that has to offer. We left shortly after 3pm, angling to be on the open part of Jay's ridgeline before sunset. We cut it close, but after 70 or so minutes of brisk uphill hiking, we emerged onto the first open areas with only minutes to spare. The real show came afterwards, thoguh, when a brilliant progression of colores played across the underside of the clouds above us. Truly excellent and well worth it, even though we had to endure a cold, strong wind. With growing darkness and an unpleasant wind, we turned around just before Grassy Notch, and did not proceed all the way to the summit. Our first visit to Jay since the NYSDEC put up a new official trail to the ridge. A perfect late summer day, cool and crisp. Discovered that the new trail is already well beaten out, well-signed, and well-engineered. Also noticeably longer than the old unofficial route. Once atop the ridgeline, the same beautiful mostly open mix of meadows, open bedrock, and little scrambles was a delight - as it always is. Upon reaching the 'commonly-accepted' summit point, I decided to continue on, and discovered a faintly-marked route that leads another 250 yards (meters) to the official highpoint, complete with survey marker. In total, the new trail and going to the actual summit adds an extra two miles (3km) of round-trip distance. Not a huge amount, but definitely noticeable. Still a super-worthwhile hike! After a long three-plus month hiatus since the last hike, we're finally out on the trail again. This time it's Jay Peak on a glorious winter day. Something short but scenic. We weren't alone on the side of Glen Road as we packed up for our outing. Two other groups from Quebec, Canada were sharing the route with us today. We got started shortly after 8 A.M., hoping to be back for 2 P.M. We had a dinner appointment that we did not want to miss and we needed a bit of time to make the long drive back home after the hike. A low snowpack and a recent thaw-freeze cycle meant that we had a hard base. Very easy to snowshoe on. 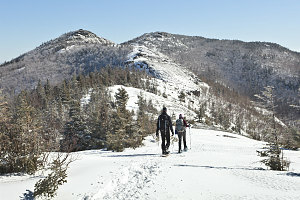 A steep but uneventful grind brought us to the first of the open sub-summits along Jay Peak's ridge. I was slightly worried about the need for crampons (I didn't have enough to supply our group of four, so I didn't bring any), but as we traversed the ridge (and especially Grassy Notch), my fears subsided. There was little ice and lots of nice, grippy styrofoam-like snow. We reached the highest point along Jay Peak's ridge right around noon. That gave us two hours to meet our 2pm return deadline. As it turned out, we arrived back at 2:08 P.M. Not too bad, and not too disruptive of our dinner plans. A great day indeed! Finally we get to hike the Jay range, a place I'd heard good things about for a long time! We were saving this one up for Luke and Sophie, and when the weather looked good we went for it! A sunny and moderately buggy day saw us parked along Glen Road, ready to tackle Jay Peak again (last October's snowbound attempt was very different than today's conditions!). Instead of having to carefully route-find, a clear and easy path led us up to the first lookout (where we had turned around last October). The hike along the ridge from that point eastward is fantastic. It is mostly open, with lots of meadows, open rock, ups and downs. 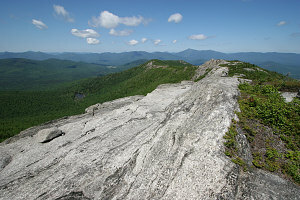 In short - it is a fantastic hike by Adirondack standards! In my opinion, this quiet rarely-visited peak ranks in the top ten of all-time best Adirondack mountain hikes. I'd always wanted to explore the Jay Range - I kept hearing word that it was this out-of-the-way shangri-la, that had wonderful views and lots of open ground. Unfortunately for us, we went hiking up Jay Peak immediately after the biggest October snow dump I'd seen in a while! (I didn't think it would be quite so deep!) So much so that it was hard to find and follow the herd path. Really, really hard. 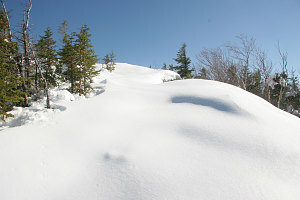 And, near the top, the snow was so deep that it was often deeper than knee-height. Should've brought the 'shoes for this one! We ended up turning around at the first sub-summit (quite close to Jay Peak, really). What we saw looked great, and we'll be back with proper gear for the conditions!